Yazsoft on Thursday announced the release of Playback 1.0, an “Extreme Media Server” for Mac OS X. It costs $15. Playback enables the Mac to share media with any Sony PlayStation 3, Microsoft Xbox 360 or other device that supports Universal Plug and Play (UPnP). It can share media stored in folders, or make entire disks available, and doesn’t require configuration, according to the developer. 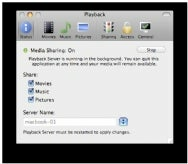 Playback integrates with iTunes, iPhoto and Aperture, so users can share playlists and albums. An Access Control List (ACL) enables users to control what devices can access media on the Mac, and you also have control over bandwidth, enabling Playback to throttle the amount of bandwidth it uses in case the Mac needs to do other things on the network, such as surf the Web or check e-mail. Yazsoft claims that Playback was designed for “extreme performance” and uses lighttpd, an open-source Web server designed for high performance environments, used by YouTube, Wikipedia and other sites. The software supports Growl, the popular system notification software, Spotlight-based searching, on-screen thumbnails powered by Mac OS X Leopard’s “QuickLook” feature, and other capabilities. System requirements call for Mac OS X 10.5 or later, 47MB hard disk space, any PlayStation 3, Xbox 360 or other UPnP-compatible device, and a network connection. Gigabit Ethernet is recommended for serving HD content. A 7-day demo version is available for download.